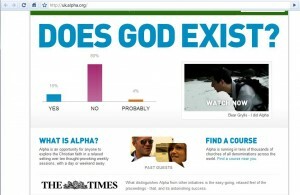 There’s a sort of low-key evangelical Christian course series in the UK called the Alpha Course, which has been franchised to a lot of churches. It generally seems harmless enough and I would guess has helped a lot of people too. They’ve been advertising too, and have posters up around Britain which say “Does God Exist?” and checkboxes for yes, no and maybe. Some guy put an x in the no box a couple of weeks ago and was arrested for defacing the poster. You can click the screenshot above to see it in full, and note the unfortunate quote from The Times: “What distinguishes Alpha from other initiatives is the easy-going, relaxed feel of the proceedings – that, and its astonishing success.” Success indeed. This entry was posted on Wednesday, October 14th, 2009 at 17:43	and is filed under reason. You can follow any responses to this entry through the RSS 2.0 feed. You can leave a response, or trackback from your own site.